Opportunities for large scale brownfield development in Winnipeg are scarce, but eventually the lawsuits over Kapyong Barracks will be settled and the building can begin. Perhaps even one day the dream of relocating the rail yards from the middle of the city will be realized, and hundreds of acres of land will become available for developers. On a smaller scale, underused industrial land in Point Douglas may be cleaned up and rezoned for residential and commercial use, and other plots of land might come available as well. When these opportunities present themselves, we should make the most of them. We should expect something beyond the typical low density cookie-cutter development that we see in new suburban developments. While we may know that we can do better, we might not know what is possible or realistic. It is helpful, therefore, to set a baseline for our expectations by seeing what else is out there, by looking at places like Stapleton. In 1995 Denver International Airport was opened, and Denver Stapleton was shut down. Planners were suddenly gifted with 4,100 acres to work with on the former airport’s land, just a 15 minute drive from downtown Denver. Construction started in 2001 and is still on-going, but what has resulted is one of the most successful (in terms of sales) planned developments in the United States. Reportedly planners from London have visited to get ideas for a potential redevelopment of the Heathrow airport land, if and when it ever moves. Does this mean that Stapleton is the absolute paradigm of infill development? No, not necessarily, although there are some very nice aspects to it. A few of the notable aspects are reviewed below. The era of solely car-oriented developments is dying as people recognize that active transportation and healthy lifestyles are important, even in suburban developments like Stapleton. Although it has the challenge of being split in half by a freeway, Stapleton maintains a pretty high standard of walk and bike-ability. Firstly, virtually every street has sidewalks. Some of the larger feeder streets have very wide grassy boulevards between the sets of lanes with crushed rock trails that give cyclists an option to avoid the road. Other feeder streets have painted-on bike lanes or “sharrows”, as do many streets in Denver. This may not be as ideal as separated bike lanes, but the street widths were designed with bike lanes in mind, so it all seems pretty safe. Then there is the green space. A wide greenbelt following Sand Creek diagonally intersects the community, with a selection of paved paths that make for a very peaceful and scenic early morning run. Connecting to this space is a network of parks that weave through the community. Virtually every house in Stapleton is within three blocks of a park with paved paths that link to the Sand Creek Regional Greenway, which in turn links to a larger network of trails throughout Denver. There may not be “low income” housing in Stapleton, but the options start with relatively affordable row houses in the $160,000 range, and end with large $600,000+ single family homes. The real diversity, though, is in the appearance of the houses. You’ll find everything from Cape Cod houses to New York-style brownstone walkups. There is modern and there is classic, and there is no apparent rhyme or reason to it. You might see, for example, a Tudor-style two story house next to a Spanish hacienda-style bungalow with tile roofing. While the range of styles may seem odd at first, it allows people with varying tastes to find a place that appeals to them aesthetically. It also beats the hell out of the stunningly dull clusters of stucco houses that you find all around the newer parts of Winnipeg. While the style and appearance of the houses in Stapleton varies greatly, they all have something in common: back lanes. 1. It allows better house designs. Almost every house in Stapleton has a porch out front and is unquestionably more attractive than any house you’ll see in suburban Winnipeg. 2. It creates a more connected community, because you have unbroken stretches of sidewalks and houses with front porches. These things increase the opportunities for neighbours to interact. 3. It creates more on-street parking. Your friends will not have to park two blocks away when you have a party. Back lanes are more problematic in Winnipeg because of our winters, but we still make them work in many of our older and more desirable character neighbourhoods. There is a perception that people won’t buy new houses in Winnipeg unless there is a garage in the front. Are we so sure that there is no market for new character homes as well? Stapleton is shaped around creeks and land contours, but it has a general grid layout, and many of the residential streets are straight. Yes, dead straight, just like you see in Winnipeg’s River Heights. I confess I never really understood why planners in Winnipeg insist on creating unnavigable mazes of curved streets, bays and cul-de-sacs. There is nothing wrong with a street that doesn’t bend, and it sure helps a person find their way around. I stayed in Stapleton for only a few days, but knew my way around (more or less) almost immediately. I could walk to the café one way, and walk back another, confident that I would not get lost. I think that, as a city, we should lobby our new mayor and council for the return of straight streets. When all of these hipsters with single speed bikes get older, richer, and start shopping for houses, they’re going to want a retro tree lined avenue to live on. We might as well get ahead of the game. Maybe I was just lucky to be staying where I was, but there was a small commercial development a few blocks away that included a café/gastropub (the one mentioned above) with an attached wine store. It had locally roasted coffee, local craft beer on tap, and a small patio. A perfect spot for a light breakfast or lunch, or to grab a tasty beer after work. Every neighbourhood should have something like this. I know that you can’t force people to open cafés here and there, but you can allow them to occur through zoning and relaxed liquor laws that get out of the way of entrepreneurs who want to start businesses like this. I think we’re on the right track in that regard here in Manitoba, but I’m still waiting for a café/pub to open in my suburb. Perhaps Winnipeg’s Waverley West (a similar sized community) will have something similar it its Town Centre, but the unwalkable layout of the community makes the success of a place like this much less likely. Stapleton is getting a rapid transit stop. I don’t mean “getting” in the Winnipeg sense, in that there is a high level plan that includes a map with a coloured line that appears to go somewhere. I mean it’s funded and it’s actually going to happen. Read more about Denver’s rapid transit HERE. It’s interesting to note that in the land use plan, not a single block is coloured as Transit-oriented development (TOD), even though the legend contains a colour for that purpose. By contrast, Winnipeg’s transportation plan has empty fields identified as “TOD”. This speaks to the difference in approach between the two cities. In Denver, the community and the transportation linkage are designed together. One supports the other. Rapid transit is integrated into the design of the development, but the development is not used to justify the transit. In Winnipeg, a transportation linkage is built or planned along side a vacant parcel of land under the assumption that something will be developed there, and that whatever is developed will be as a result of the transit linkage, and furthermore that the development will create funding for the linkage after the fact. There is less of a risk in building rapid transit when the population base is already in place, and when funding does not depend upon wishful thinking. As it turns out, Winnipeg is not the only city that struggles with dealing with useless old buildings. 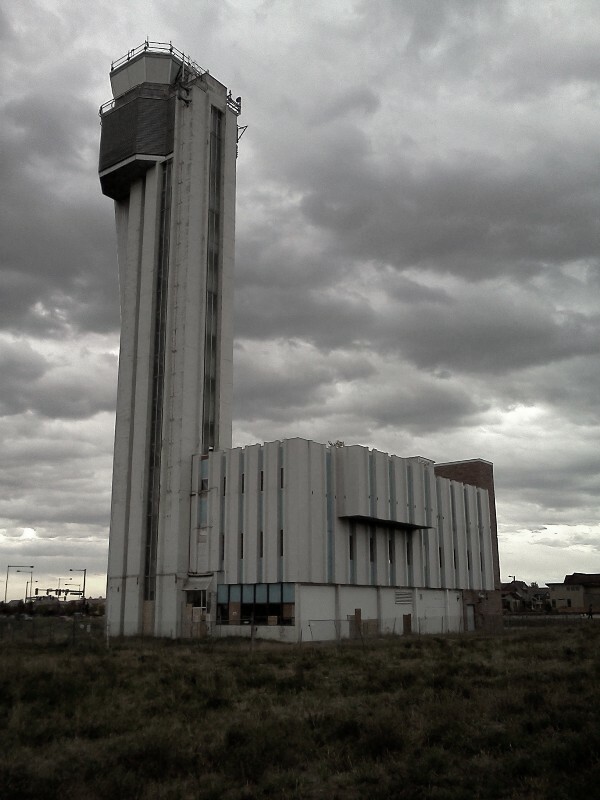 Sometimes one man’s junk is another man’s architectural treasure, and that is certainly the case with the old Denver Stapleton control tower. Built in the same modernist era as Winnipeg International’s former terminal building, the old Stapleton control tower was never torn down. It stands, worn and faded, in the corner of an otherwise vacant city block, like a little piece of industrial Detroit dropped in the middle of a progressive residential neighbourhood. I am sure somebody out there believes that the building could be re-purposed as a brewery or something else. Others may think the architectural novelty of the structure is worth maintaining the building even if it stays vacant. Meanwhile, an entire block of valuable real estate sits completely unused, as the future of this building is debated. Sometimes we need to let go of the past, and I believe this is one of those cases. Whatever merit there is in maintaining this monstrosity is trumped by the opportunity cost of holding back development. If it were a more functional design the scale may be tipped in the other direction, but there are only so many things you can do with a control tower. If you’re planning on moving to Denver (it is quite a nice city … I would not discourage it), you could do much worse than Stapleton. It is certainly not a urban mixed use paradise, but it is definitely a functional and well designed suburb that offers much more for it’s residents than any suburb in Winnipeg. Some of the amenities and features may not be feasible in a space like Kapyong Barracks, but certainly we could learn a lot from a development like this pick out those things that translate well to the spaces we have here in Winnipeg. We need to do something to alter the mindset that results in the same dull and dysfunctional developments that plague our city. 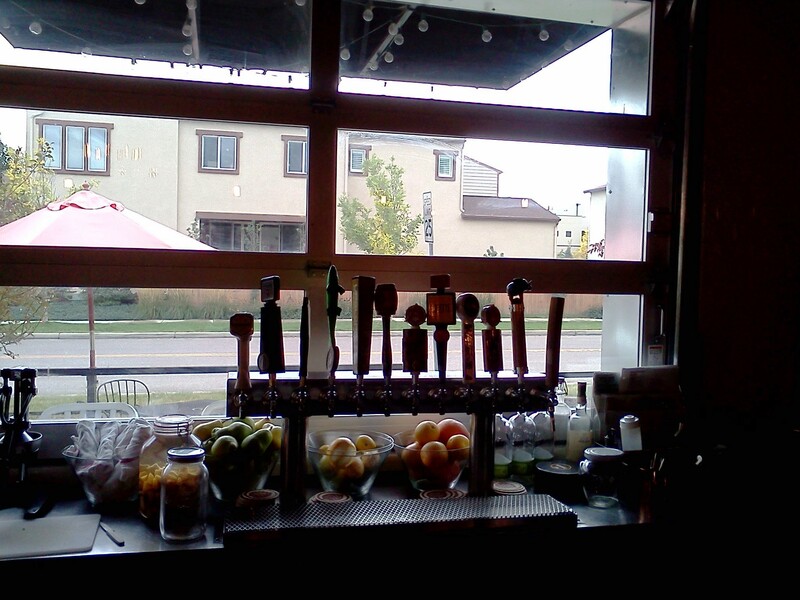 Looking to places like Denver’s Stapleton is a good place to start.